EDINBURGH UNIVERSITY boss Dorian Ogunro didn’t envisage his team’s drastic slump in form which saw them catapult down the Lowland League to tenth spot, but he isn’t concerned with their league position. The Students are on a six-game winless run stretching back to mid-November, having enjoyed terrific early-season form which had them on the verge of a place among the top six. Uni’s torrid spell arrived entirely out of the blue following their best-ever start to a Lowland League season, but they have struggled to find the net in recent times, with an alarming 13 goals conceded and just four scored since claiming their last victory. Ogunro has challenged his shot-shy team to return to basics in a bid to stop the rot and is demanding a positive response when the pitch up at Ainslie Park for their encounter with Spartans tomorrow. Speaking ahead of their first match in more than a fortnight, Ogunro said: “It’s been quite unexpected that we’ve fallen away because prior to beating East Stirlingshire we were unbeaten in five games. “We’ve not really been playing that badly, in all honesty. It’s a strange one because from the outside it might look like we’ve not been doing well, but our performances have been quite good. “It just comes down to experience and game-management. Barring maybe one or two games since the end of November, we should’ve picked up more points than we have done. “That’s been my biggest frustration, small margins make the difference in this league. For example, we should’ve beaten East Stirling again and had numerous chances to kill them off when we were 1-0 up before shipping two late goals. “It’s understandable that our consistency levels aren’t going to be the best in the league because we’ve got a young team, of which many of the players haven’t played Lowland football before. “The reality is that with the resources we have and our aim of continuing to develop players, we are probably a mid-table team. He added: “There’s every chance we can go to Spartans tomorrow and bring back three points. We probably should’ve beaten them earlier in the season when we drew 1-1. Meanwhile, Spartans attacking midfielder Scott Maxwell became the club’s latest centurion against Tranent last weekend, the second time in his career he has reached the 100 landmark. The 28-year-old stated: “It’s always nice to hit that target. Reaching 100 games at any club just proves how much you’re enjoying your football and that’s certainly been the case here for me. Elsewhere this weekend, Whitehill Welfare know anything less than a victory over Cumbernauld Colts at Ferguson Park would deepen their relegation woes. 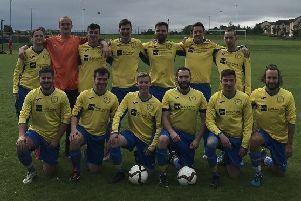 Ian Little’s side have accumulated a mere seven points this season, and they are five points adrift of second-bottom Dalbeattie Star with games beginning to run out for the Midlothian club – they have nine to play. Fourth-placed Civil Service Strollers will look to strengthen their chances of a top-four finish when they make the trip to face Vale of Leithen in the Borders.